Tuning in lever harps in E-flat Major — Rees Harps Inc. Pro harper Marta Cook on tuning lever harps in E-flat Major. Lever harps are often also called Irish harps or Celtic harps. We are also the makers of Harpsicle® Harps. Rees has been building harps since 1972. Our harps are hand crafted in Rising Sun, Indiana, United States. Marta Cook playing a Rees Mariposa Concert Line Harp at the Vancouver World Harp Congress. Marta is very pro chocolate. 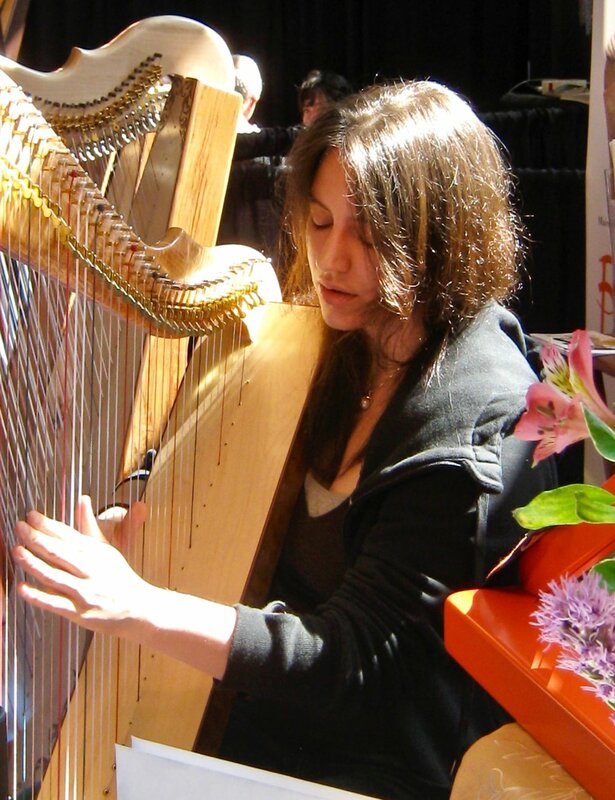 Camille Fournier at NAMM 2015 playing a Rees Mariposa Concert Line Harp tuned in E-flat Major. What’s the Big Deal with E Flat Major? Tuning is just about my favorite thing in the whole world or, at least, that’s how it probably looks to anyone who’s ever been in any kind of ensemble with me. I’m forever telling them to shut up so I can get on with it. This is bad for band morale. It’s also bad for my morale, because by the time I get to the green room, all the Twix are gone. So in general, I’m a huge fan of anything that minimizes time spent with a tuning key in my hand. My very first harp had no levers at all. I kept it tuned to a C scale, like the white keys of a piano, and limited my repertoire to tunes in G, D, F, and, on very special occasions, A. If I wanted to play in G, I had to tune all my F strings to F#. If I wanted to play in D, I had to tune the C strings up as well. If I wanted to play in F, I had to tune my Bs down. It was all very tedious. I resolved that as soon as I got a harp with levers, I would never, ever tune another string unnecessarily.. So how does tuning in E flat solve anything? It’s pretty amazing, actually. The thing is, levers are simple. They have two positions, up and down. That means each string on your harp is capable of sounding any two pitches that are a half step apart. Think about it. The key of E flat has three flats: B, E, and A. To tune in E flat, you simply tune all the Bs to Bb, all the Es to Eb, and all the As to Ab. One of the easiest ways to do this is to put the B, E and A levers up, and then tune your whole harp to the C scale, using your electronic tuner as usual. What happens when, say, you put your B lever up and tune the string to B natural? You put the lever down, and you get B flat. Your B string now has two pitches a half step apart, Bb and B natural. If you had tuned the B string to B natural while the lever was disengaged, the two notes available to you would have been B natural and B sharp. Pretty cool, huh? Most harpers find that they use Bb a lot more often than they would use B sharp. They also find that they use Eb a lot more often than they use E# , and Ab a lot more often than they use A#. In fact, if you think about it, B# on the harp is the same exact thing as C natural, E# is exactly the same as F natural, and A# is exactly the same thing as Bb. Confused yet? That’s the point. It is pretty much the most confusing thing in the world to think, hmm, I want to play B flat. Better put my A lever up! This kind of stuff does have its uses, and a name—“enharmonics”—but that has nothing to do with what we’re concerned with here, which is simply to figure out how to most easily get your harp into the keys that will allow you to play a wide variety of music. So here we are, with your fully levered harp tuned in E flat major, with B, E, and A strings tuned to B, E, and A flat rather than natural. What keys can you play in? Well, with all your levers down, you are in Eb, or c minor. Put up your A levers, and you are in the key of B flat, or G minor. Put up the E levers, and you are in the key of F major, or D minor. Put up the B levers, and you are in the key of C major, or A minor. Put up the F levers, and you are in the key of G major, or e minor. Put up the C levers, and you are in the key of D major, or B minor. Put up the G levers, and you are in the key of A major, or F# minor. At this point, you have only one lever left to put up: the D lever. Put it up, and you are in the key of E major, or C# minor. That’s seven different keys. The thing about a lever harp is, because you only have two pitches for every string, you will only ever be able to play in seven different keys without retuning. But seven keys are plenty! The trick is to pick the right seven keys. If you tune your harp to the C major scale, the seven keys you have available are C, G, D, A, E, B, F# and C# major, and their relative minors. When was the last time you played in B, F#, or C# major? I didn’t think so! On the other hand, I bet it won’t be long before you come across a piece you’d like to play in F, but with no B-flats available on your harp, looks like you’d be in for some re-tuning fun. This is why harpers like to tune in Eb. It means we have easy access to the seven most most useful keys for a wide variety of music, and we rarely have to re-tune. Not only that, but tuning in Eb means that we’re pretty close to some other keys that happen rarely, but still a lot more frequently than F# major. Even if someone decides to torture us with a piece in A flat, we’re nearly there already with all our levers disengaged—we’d only have to tune down our D strings. And remember, less tuning usually equals more chocolate. That’s pretty much the definition of having your cake and eating it!